Does Global Warming Cause Coastal Reef Islands to Disappear? Testut, L., Duvat, V., Ballu, V., Fernandes, R.M.S., Pouget, F., Salmon, C. and Dyment, J. 2016. Shoreline changes in a rising sea level context: The example of Grande Glorieuse, Scattered Islands, Western Indian Ocean. Acta Oecologica 72: 110-119. Introducing their study, Testut et al. (2016) write that reef islands are widely thought to be highly vulnerable to climate change, in particular to sea level rise and to extreme climate events, such as tropical and non-tropical cyclones, while further noting that sea level rise is often perceived as casting doubt on reef islands future habitability. And it was against this backdrop of pessimism that the seven European scientists went on to assess the likelihood -- or not -- of these several negative contentions actually occurring in the real world of nature. More specifically, Testut et al. acquired baseline data on both absolute and relative sea level variations and shoreline changes in the Scattered Islands region of the Indian Ocean, based on aerial image analysis, satellite altimetry, field observations and in situ measurements derived from the 2009 and 2011 Terres Australes et Antarctiques Francaises (or TAAF) scientific expeditions. And what did they thereby learn about the matter? In the words of Testut et al., "Grande Glorieuse Island has increased in area by 7.5 ha between 1989 and 2003, predominantly as a result of shoreline accretion," which "occurred over 47% of shoreline length" (see figure below). They also note in this regard that "topographic transects and field observations show that the accretion is due to sediment transfer from the reef outer slopes to the reef flat and then to the beach." Based on these findings, Testut et al. conclude that "this island expansion during a period of rising sea level demonstrates that sea level rise is not the primary factor controlling the shoreline changes." Quite to the contrary, they note that their findings highlight "the key role of non-climate factors in changes in island area, especially sediment availability and transport. And they also cite evidence of real-world island rotation, "underscoring the highly dynamic nature of reef islands." 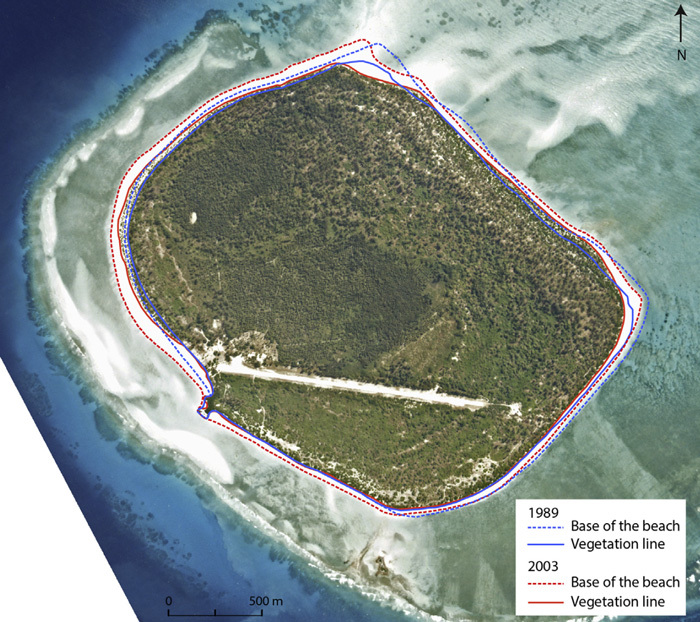 Map of shoreline changes on Grande Glorieuse Island between 1989 and 2003 illustrating the highly dynamic nature of this reef island. Source: Testut et al. (2016).